In pursuit of justice and revenge, Faith hunts through her father's possessions and discovers a strange tree. The tree bears fruit only when she whispers a lie to it. The fruit of the tree, when eaten, delivers a hidden truth. The tree might hold the key to her father's murder - or it may lure the murderer directly to Faith herself. This novel may seem like an odd choice for a blog about crime fiction, given that it could be regarded as a young adult coming of age story. 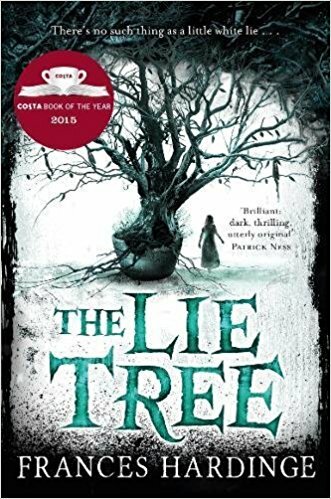 However, The Lie Tree is a novel that works on many levels that go beyond labels such as young adult fiction or crime novel. In fact, this book is hard to categorize, given that it contains so many elements. On the surface this is the story of a teenage girl living in Victorian England named Faith Sunderly who feels out of place in the social world she inhabits. Her father is a well-known natural scientist with little time for his children and her mother is focused on fitting in with social mores to the point that she is guilty of hypocrisy in the eyes of her daughter who is learning to understand how the adult world functions. Her younger brother is the favoured child because he is male and can expect to carry on the family name when he is older. All Faith can do to honour her family is to marry well. For Faith, this isn’t the future she sees for herself. Seen as difficult by the adults around her, Faith utilizes what she sees as her greatest talent – fading into the background and listening to what others have to say, unobserved. I enjoyed this book a great deal and as I wrote above, this is a book that defies description and can’t be placed in any one particular category. Lies are told, murder is done and a daughter comes to realize that her father was fallible and all too human. Like many people, he is willing to lie in order to get the things he desires. Through investigating his death, Faith is able to come to terms with the man her father was and the person she hopes to become. The Lie Tree won the Costa best book award in the UK in 2015. Despite being marketed as a book for young adults, I’d recommend this tale to anyone who enjoys a well-written story with realistic characters that stay with you long after the narrative ends.